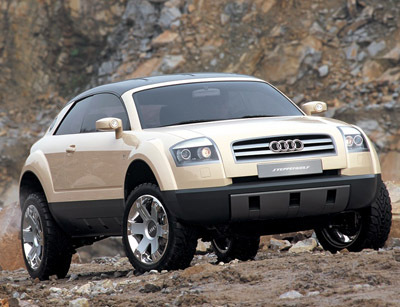 The Audi Steppenwolf concept from 2000 was a vehicle designed to be as capable on roads as it is on gravel tracks and mild off-road terrain. The chassis of the Audi Steppenwolf concept (which was based on the Audi A3/TT platform) features 4-level air suspension, giving up to 223 mm of round clearance. The suspension settings adapt to suit the driving surfaces and conditions. Powering the Steppenwolf concept was a 3.2 litre V6 which produced 220 horsepower. This was coupled to a six-speed manual gearbox driving all four wheels through Audi's proven full-time quattro AWD system. This setup gave the Steppenwolf a 0-60 mph time of under 8 seconds. 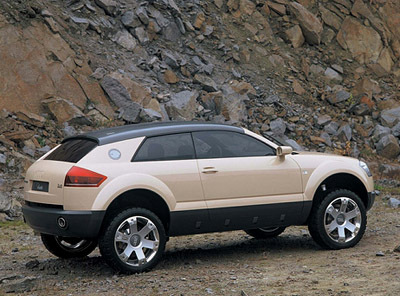 The Audi Steppenwolf featured deeply contoured bumpers, painted dark grey to contrast with the sandy body color. These were designed to highlight the vehicles off-road potential, just like the spotlights in the door mirrors. The Steppenwolf could be fitted with either a carbon fibre hardtop or a detachable soft top. The soft top for the Audi Steppenwolf is made of sealed textile fabric and, as on many off-road cars, is fitted by hand.